I LOVE VINTAGE COSTUME JEWELRY. 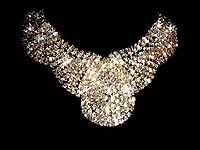 THIS PAGE IS ABOUT THE PRAISES I RECEIVED FROM MY VINTAGE COSTUME JEWELRY CUSTOMERS. In late February, I received an e-mail from a very nice lady, Patricia, asking me to find a perfect jewelry set for her to wear at the Art Deco Ball in San francisco in early March. The theme of the ball is Orient Express. She had a dress designed and made for this special function and wanted me to find a perfect jewelry set to match. I was, of course, delighted to be given the opportunity to help. She faxed me a copy of her designed dress. 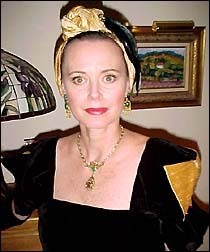 The dress is a very sleek, elegant, velvet black dress with gold lining that shows though the sleeves. The dress also has a turbin to match. Such beautiful attire for me to work with! 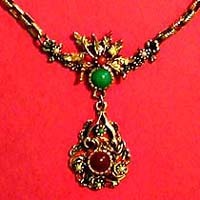 Among the necklaces and earrings I had suggested, Patricia selected a gorgeous jewelry set which has an Oriental flair. Thank you SO much for your wonderful assistance. You are very helpful and so professional. I had a WONDERFUL time at the Art Deco Ball. Everyone loved your jewery and I gave your website address to several of the ladies. Thanks again for all your help -- I will save your information for the next time I need anything. 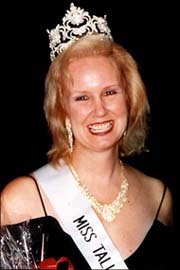 Am attaching a picture of the necklace and earrings that I wore at the Miss Tall Boston pageant and I will be wearing them again at the Miss Tall International competition in the Caribbean in June!! I just this minute got my crystal and seed pearl necklace. As great as it looks off, it looks just amazing on. It's stunning, and will always be one of my most favorite. What an incredible way to start my collection of vintage jewelry--it's one of those pieces that I'll just never be able to top. Thank you, too, for the special attention you took to wrap it. Let's face it, a wad of newspaper would do the trick, and I received it as you offered it, as a gift. Your thoughtfulness and attention to detail, and the warmth of your notes, makes me eager to do more business with you. Your Hawaiian kindness has taken a little chill from this icy northeast. The lovely necklace arrived safely last Tuesday. It's just beautiful and really made my day. Thank you so much for your TLC in preparing it for shipment and mailing it out. Now I'm looking for the proper opportunity to show it off! Take good care and thanks again! I found your store. It is so irresistible! I am always looking for long, dangly earrings and you have so many of them. I am enjoying all your beautiful items. I could spend $500 in a breeze in your store. I did purchase that beautiful Judy Lee multi color rhinestone twisted rope set. Please let me know the shipping so that I can send payment. Well, I have to run. Talk to you soon. Congratulations on your shop and beautiful jewels. Either you are a mind reader, or you know how long it takes for a package to arrive from your area. I received it last night and opened it this morning! 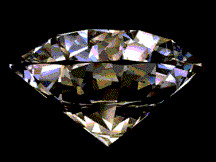 Annie, you do such a great job in the presentation of the jewels. I just adore those little red pouches. You have a lot of class! I am thrilled with everything. I can't wait to give my daughter the butterfly set. It is for Valentine's Day. The Judy Lee bracelet and earrings are so beautiful; like they have not been touched. I so like their color stones. And the silver earrings will be great with jeans. Thanks so much, Annie. I will visit your store from time to time. Please add me to your mailing list and let me know when you are showing special items. Thanks so much for the quick reply and for trying to do this on New Years Eve!!! Wow!! Have a great holiday!! Thanks again!! The necklace arrived today. It is very lovely and looks very deco to me. Thanks for all of your cooperation with my purchase. It took awhile but it was worth it. Best of luck for the future. Hopefully we will meet again. Be well. I will definitely let you know when the package arrives. Thank you ever so much for sending it through UPS so as to get here by Mother's Day. I really do appreciate you going out of your way to ensure the arrival time. Have I said "your the best" lately? In true "Annie" form, you have once again made this whole thing such a pleasure. You are awesome. I can't say that enough. Thanks for all your time spent with me on all of this. Your website is of course in my "favorites" folder. I'll definitely be shopping with you again and again! :-) You can use any testimonial of mine. I would love that and every word of it would be true. I could probably write a 10 page essay on how wonderful it has been doing business with you and in the process find someone I feel have been a friend for years! The jewelry is beautiful and I haven't taken the necklace off yet. My Mother in Law also absolutely adored her necklace and has told me so several times. Anyways, thank you so much for everything. You can bet I'll be recommending any and all of my friends to check out your website and what a treat it is working with someone as knowledgeable and as sweet as you are! Take care and I'll talk to you soon. Hi Annie......thank you so much for your consideration and the follow up. Yes, the necklace arrived in great shape and I love it. Nice doing business with you. We wish you and your family a happy 4th of July as well. The earrings did arrive in fine shape and are just lovely! Thank you. Have a wonderful 4th yourself! I received the package today - and it was wrapped so beautifully! Thanks so much for the jewelry pouches as well. Everything was beautiful, and I am so pleased. Hey, Annie-WOW I never expected that jewelry set to look so beautifully unique-I love it-thank you, also, for your careful packaging. wanna tell ya also, i enjoyed my "virtual visit" on your lanai-loved that sunset-thank you for sharing. look forward to "seeing" you in the future. actuallly, i am kevin's wife, chris, he doesn't wear crystal jewelry! You beat me to writing to you! Yes - I did find the package late this afternoon - and love all of it, as usual with your pieces. What is really amazing to me is the pristine condition that the pieces are in!! Thanks so much as always. Stay well. Aloha! I have your website saved to my favorites and have forward your website on to some other girlfriends of mine that are all vintage jewelry junkies! You will definitely have me back to do more shopping! I loved everything on your website!!! Thank you so much for the great customer service! I appreciate all your help!!! Just to let you know that the beautiful bracelet and earrings arrived safely yesterday and I am wearing them today. They have been much admired. Thanks again for the wonderful jewelry. I will be visiting your site again and have already mentioned it to friends. Yes, thanks so much, sorry for not letting you know earlier, but things got backed up with computers with the black out, but the watermelon bracelet arrived safe and sound, its beautiful, thanks again. Yes, I received them. They're beautiful! Thank you. Hi Annie, Just wanted you to know the jewelry arrived and safely. It is splendid and as beautiful as I'd imagined. April. Wow, this bracelet really knocks me out! I love it! I got it yesterday, and keep trying to put it away, but I just can't stop looking at it. And it's another one of those pieces that, no matter how great it looks off, it looks that much more amazing on. Really, it's special. Thank you again so much for the bracelet. It's just beautiful. I'm so glad we talked, because you were right on your web site, the picture didn't do it justice. I'm sure I'll wear it a lot. I received the rhinestone brooch and yes I love it. Thanks!!! Thank you for the follow-up. The necklace is stunning! My husband said, " you can't wear that! Somebody will clonk you over the head for it!" I am going on a cruise next week and will be wearing the necklace. I told my girlfriend going with me on the cruise that the necklace is my favorite purchase for the cruise. Thank you! Thanks for the followup. She fell in love with the bracelet and earrings instantly, and immediately started listing outfits she could wear them with. She commented a number of times that she never had seen anything remotely like them. She asked where I got them, and I replied that there's this little place in the Islands that is supplier to the Stars! 8>) Rest assured, I intend to become one of your "frequent shoppers". I truly appreciate your extraordinary collection of beautiful jewelry; and your personalized customer service is absolutely top notch! Thanks very much. i just got the package from you - and I love the way you wrapped everything and put each set in a pouch. And - I love everything! It is all in such good condition - and in your usual good taste. I especially love the Miriam Haskell black bracelet with rhinestones - it looks brand new! Very unusual. So it looks like I am set for the upcoming Holiday affairs. Thanks again. The bracelet arrived today, and all I can say is WOWEE! Good think I'm not the shrinking violet type! Thanks again - I know I'm really going to enjoy wearing it and blowing everyone's sox off this holiday season. The UPS delivery man just came to our door at dinner time. So I had to wait until after eating to open the package you wrapped so special. As you promised I am more than delighted with the Eisenberg! Do you think this may be a one of a kind? Will try and persuade my daughter Katharine to model the set and I will take a picture to send to you. Be sure to keep in touch if you aquire anymore special items. It is finally Winter here, stormy, cold and dark today. Thanks again very much. Since the post office was not open on the weekend, I did not get the package from you until today. And the earrings are even more beautiful than I expected! I am all set for the holiday season now - and all thanks to you. Thanks so much and for following up with me when you didn't hear from me last week. I do appreciate it. Have a wonderful holiday season. Stay well. Yes! I did receive it and it is spectacular! I am very pleased....When you say near mint condition, you really mean it. Thank you for following up. My lovely pink earrings just arrived --- they are so sweet. Unfortunately, my mother loved them too! So, she claimed them, saying I owe her a lot of favors. They are just as you described. Thanks so much. It's a pleasure to do "business" with you. Best regards.....Diane. Good news the brooch arrived today I just got home from work and found it. It is every bit as beutiful as I thought it would be. I also appreciate the way it was packed. It has been a real pleasure doing business with you and hope to buy again. As the saying goes "All's well that ends well". She loved it. I gave her a copy of your information on Juliana pieces from your website, and she was delighted. Thank you again for your wonderful service. I have bookmarked your site and will definitely be watching for her and me. Hello again, sorry I have not been able to get back to you sooner, first of all my two pairs of earrings and choker arrived safe and sound and are all absolutely georgous.I am back on your site and have seen a bracelet I would like to purchase no. BR16816, could you hold it for me until I can organise a paypal payment. Kind regards and Merry Christmas. I'm thrilled to bits with my earrings. I know they are for special occasions, but I wore one pair all evening whilst wrapping Christmas pressents. I felt very glamorous. Merry Christmas and Happy New Year from a wet, cold but now more glamorous North East of England! I'm in love with my bracelet by Alice Caviness. Taking another look and your collection and you've caught my eye once again. Let me know if you still have this set #S16862. Thanks for asking. I was completely satisfied with the brooch. I needed a special gift and the recipient just loves it! Thanks! Annie, the piece is beautiful I am very satisfied. Thank you. WORE THE NECKLACE AND EARRINGS TO A WEDDING TWO WEEKS AGO AND YES IT WAS ABSOLUTELY BEAUTIFUL. THANKS AGAIN. Just wanted to let you know that I received the Juliana amber jewelry set today. It is truly gorgeous! I'm really looking forward to receiving the next batch of jewelry, too. I'll keep checking back. First I must tell you that the faux pearl set is fabulous, fantastic, I love it, love it, love it. It is so clean and beautiful. Thank you. Thanks April. Just received the necklace today. Thanks so much for everything.Will keep looking at your items and have told a couple of my friends how nice you are. Only problem is they do not have home computers.Take care. Hello to your husband and the kitty's. I am so sorry I meant to e-mail you sooner. Well, I just cannot tell you how much I love my Art Deco rhinestone necklace! It is absolutely stunning! It far exceeded my expectations. You can definetly put me down as a very satisfied customer. Thank you so much. I just wanted to let you know that the necklace arrived as expected today, and it's truly a beautiful piece. I really, really hope that it works with my dress, because wearing a unique necklace like this would be the perfect addition to my big day. Receiving a package from you is like Christmas come early. :-) I adore the paw-printed tissue! The earrings are also adorable, and I can't thank you enough for such a thoughtful and lovely gift. I'll write again soon to let you know how it went. Thanks so much for your exquisite service, your good cheer and your eye for glamorous gems! The necklace looks fabulous with my dress, thanks so much! I think the earrings offer a bit too much sparkle for my personality to wear with the necklace, but they're perfect for the rehearsal dinner. :-) At this moment I'm passing along your web site to my mom and my bridesmaids! Greetings from snow Colorado! Just wanted to let you know I received the ruby red necklace and the Hobe set yesterday. They are really beautiful. I love my Juliana bracelet and earring set. They are just as you described... Carmel. Thanks for your email. So sorry not to have contacted you before now. My brooches have arrived and I am delighted with them, particularly the Maltese cross, which is truly stunning! I am loaning to my Mum this weekend to wear to a wedding as she is wearing a grey suit and it will look fabulous with it. Once again thank you for your tremendous service. Hope all is well with you. I'm signing off now to go and look at the new pieces you have listed! I absolutely adore my earrings! The earrings shimmer --- and the baguettes have a wonderful natural look. They are more than I expected. The picture did not do them justice. My mother is a critic of jewelry --- and she loved them too (hmm). They are certainly in excellent condition being from 1945! Thanks so much. I love the DESIGN. You are the best! Best regards to you and your furry friends. Diane. Received the bracelet the other day-I've been meaning to let you know. It's beautiful. I just love it. This year my Easter outfit is going to be based around this bracelet. I'm going to find something to wear so it matches the bracelet, I guess something pink. Thank you and always send me your new postings of items. Have a great day. April. I received the 3 strand grey pearl necklace today and it is just beautiful! I intend to wear it to give a vintage touch to my cool modern suits. Thank you for having beautiful and affordable jewelry. Your friend and customer for life! Love the necklace. Wore it at my birthday party. Thanks for the follow up. I lurk on your website all the time dreaming about other stuff. Julie. Yes, I am very pleased with the earrings and bracelet. Thank you! Monica. My wife is very happy with the butterfly. It is gorgeous. I have just recieved my Huge Amber Crystal Rhinestone Antique Brass Clip On Earrings. They are incredible! I love the packaging, too. I love the earrings!! I am very pleased with them!! They will look awesome because they are so unique compared to anything i could find in a store!! Everyone I show the earrings to says how cool they are. Thank you so much. Just wanted you to know that the Miriam Haskell necklace arrived in excellent condition. I really like it and now I shall be on the look out for a bracelet to match. Thank you once again for the care that you take to ship an item, it really makes you want to come back to buy again. Thank you. My gorgeous jewels arrived yesterday - and as usual with your things - I love all of them. And also as usual - they are in spectacular condition. I especially love the Haskell bracelet - I have several vintage necklaces of hers that will go with it wonderfully. And the "ruby and diamond" parure is to die for! And of course I also love the dangly sparkling chandelier earrings. Thanks so much for your wonderful taste and service. Received the earrings last week. Very nice. Great to purchase from you again. Will keep looking. Take care and Hello to your husband and the kitty's. My beautiful earrings arrived yesterday, Friday, May 28th. They are as beautiful as you exactly described them on your website. And they arrived in perfect condition. Thank you also for the beautiful little bag to keep them in. I was just sitting down to write you when I found this email. You , as usual, have some great new things! I was writing because my husband just brought me the beautiful amber colored dangling earrings. I love them! Thanks so much for the wonderful service and taste. Stay well and have a great summer. Thanks for your note. Everything was wonderful with my necklaces, they arrived on time for my special dinner. I wore the black and diamonte necklace and it looked great. Thank you for your excellent service. I am just saving up for the next purchase. I'm sorry I didn't write you. The set is gorgeous. I love it and have worn it three times already. I so appreciate getting your new things by e-mail. Keep them coming! I'm the one who bought the 4-string choker strand (necklace and bracelet) from you in the spring: the soft pink/cream faux pearls. Every time I wear that set people ask where I got them and I tell them about you! I have my first dress fitting this Saturday. The necklace certainly is beautiful! I just wanted to drop a line to let you know that I have received my latest pair of Annie earrings. The beaded white hoops are perfect for topping off a sun dress. Fabulous, as usual. Annie, The bracelet is so fabulous I wore it with my blue nightgown at home! :) Susan. The bracelet is really vintage and heavy! It is wonderfully made. When I wear this (I did with my jeans already) I will simply pretend I am one of the great stars of the l930's --- when stars had class. Annie, the pin arrived today and it is truly beautiful. Thank you so much. Also a huge thank you for the extra silk pouch. I look forward to many happy hours searching your site. I RECEIVED THE NECKLACE AND EARRINGS, WOW !!!! THEY ARE BOTH MORE LOVELY THEN I EXPECTED. THANK YOU FOR SENDING THEM OUT SO QUICKLY AND PLEASE LET ME KNOW IF YOU DO NOT RECEIVE MY PAYMENT OF $128.00 DONE TODAY 9/8/2004 FOR ITEM # P16843. She absolutely loved the pin. Couldn't take her eyes off it, put it on immediately and pranced around from mirror to mirror. Thank you so much. Please keep me in mind for more special pieces. She particularly likes colorless, although I don't think I will find a better piece than the one I bought. I just had to let you know my vintage jewellery arrived yesterday (much earlier than I expected) and I am absolutely thrilled and delighted with my purchases. The descriptions regarding condition, etc. are exactly as you described on your website. I thank you for the care taken to wrap them and also for dealing with my order so promptly. You will certainly be hearing from me again. Just a quick note to say thanks again for the lovely necklace which I bought from you a couple of months ago. My fiancee will be wearing it at our wedding this Sunday, and we're both delighted with it. I just received the beautiful chocolate brown necklace and I am totally thrilled with it. Thank you so much and I plan to buy more in the future. The necklace arrived yesterday and it is, indeed, beautiful...and in excellent condition. It looks like it has been well cared for over the years. It's a lovely addition to my collection... It was a genuine pleasure to do business with you...although it didn't feel like business. I felt that I was dealing with a friend who was just as delighted as I that I had found a new piece of jewelry to enjoy. I'll continue to monitor your site and will pass it on to others who share our love for vintage baubles. I feel certain that you'll hear from me again. There's always another piece of jewelry out there...to quicken the heart. As I said, I've only bought on the internet once. I was concerned about buying white rhinestones...sight unseen. But you are as good as your word. Thanks again. You are too much. How did you know I also wanted a pink pouch, this time. I almost requested it but decided I wanted to be surprised. I love my necklace set! Beautifully packed. Thanks a million. I have loved everything I have bought from you.... I will be snooping around your website again...and again. The pin is for my mom for Xmas and the bracelet/earrings for Me! The items arrived safely -- very pretty! I'll keep watching your website. I just wanted to let you know my earrings arrived last week - they are gorgeous. Thanks. RECEIVED THE BEAUTIFUL MADONNA LUCKY STAR EARRINGS AND PICKED THEM UP FROM THE POST OFFICE, MANY THANKS, AGAIN!!! VIRGINIA. I'm very much looking forward to wearing my new (old) earrings to our special Christmas celebrations. A friend of mine received a gorgeous brooch for her birthday and the gift giver bought the brooch from you. That is how I learned about your wonderful website and I am very glad I did! Thanks again for all your help and I hope you and your family have a very memorable holiday! I received the bracelet Monday the 27th. It was beautifully wrapped and in fine condition. Although I received it after Christmas, the timing was great. As it turned out, I haven't seen the intended recipient yet. Thank you so much for your help and trouble! I'll keep an eye on your site. my beautiful brooches arrived today and I am delighted! Thank you also for the nice and careful packaging, the delicate pieces did not suffer at all from the long way from Hawai to Paris... It was a pleasure doing business with you. I will sure be back soon visiting your pages. All the best wishes for the new year, C., PARIS, FRANCE. I love the necklaces! I am sending both pieces to my friend to see what she thinks. She is very excited. Thanks again and I look forward to doing business with you in the future. Robin. I received the earrings today and they are even more dramatic and beautiful than I expected; plus, they are in absolutely pristine condition. I wanted to let you know that they arrived safely and I thank you for the obvious special care that was taken in packing and shipping them safely. The little green silk envelope purse was a nice touch. As expected, I already have a special event lined up - our local Heart Association winter ball is coming up in February; and you can count on the fact that I will be wearing these gorgeous earrings and getting many compliments. I look forward to browsing your site frequently and will be in touch. It's been a pleasure to make your acquaintance. I received the earrings on Sat..you can't be shy when you wear them.. but I love all the colors ...I wore them Sat night... I like them..
Hi Annie,	I got the earrings - and as usual with your pieces - love them. And got them in plenty of time for my function. Stay well, Janet. Just received the beautiful earrings. Thanks so much. Also thanks for sending the Hawaiian sunshine. It is beautiful weather here today. Hope to visit the Islands soon. I just wanted to tell you that the broach arrived yesterday. When I returned home from work there it was in all it's splendor...I love it, it is in flawless condition. I wore it today on a black suit jacket, and I have had a number of compliments. Thanks you , and I look forward to being a return customer. I will look on an ongoing basis on your site for new pieces, and I am sure I will find another lovely piece in the time ahead. The beautiful Schiaparelli brooch arrived today in perfect condition. Greatly impressed with it. I will be shopping your web sit again. By for now. Rec'd my goodies today - loved each and every one - they were packed so well and wrapped so safely -thanks so much. Phoebe. The pegasus brooch is wonderful, I wore it right away. Reminds me of my free and wild colt. Donna. I have received the beautiful jewelry. I'm so excited! You can count on me continuing to order from you. Thanks so much. Oh, Annie, I received the Trifari set. I love it and have already worn it twice and has evoked a lot of compliments. It is 70 here and sunny. Tulips, forsythia, azaleas, rhododendrons exploding everywhere. Susan. Hi Annie - just wanted you to know that the earrings arrived safely today and, as expected, they are drop dead gorgeous. I already tried 'em on and they are perfect. The photos didn't do them justice. Thanks for taking the time to package them so carefully - your extra touches don't go unnoticed. The silk bag is adorable and will be nice for storage. Thanks again for another wonderful Annie' s experience! See you again! I received my pair of gorgeous clip-on dangle earrings today! How pleasantly pleased I was after opening the package and discovering how very beautiful they were! Thanks for the professional way you handled my order, and for conversing via E-mail with me. That personal touch goes a long way with me! I can't wait to wear my new earrings for all to see! I am so excited! Can't you tell? Thanks, again, Annie, for everything! Thanks, Annie. The necklace arrived in great shape and it is terrific. Thank you...and I'm looking sooo forward to my necklace and earring set. All the beautiful jewelry, has arrived, safely. Thank you and have a great holiday. Thanks so much for every thing!! You're the best! I love the bracelet!! I can't wait to wear it!! I'll check your pieces often!! (is it ok to "aloha" twice?) My jewels just arrived and I opened them with much anticipation; and............lovely, the most! They arrived in perfect shape (you bubble wrap flawlessly, I might add) and I am sure I will be wearing the set very soon. The little pouches you send them in are a nice touch as I know what is in them and it keeps them in good shape. Thanks again, and I am sure you will see an order from me again in the near future. Thank you Annie. The silk pouches arrived yesterday in good shape. They are just what I needed. My Jewels were indeed waiting for me and, once again, they are as fabulous as I'd hoped they were going to be! I am now on a quest to find rhinestones to fit the one pair. Those are truly amazing the way they follow the outside of the ear; and actually, you can't really tell the stones are missing from a distance, so I'm not sweating it too much. Thank you for the previous order, they're beautiful. Ana.